I just returned from San Francisco, where I spent the weekend at Vogue Knitting Live. I was there to take some classes, look for some hand-dyed yarn for future projects and, very excitingly, because I had entered the Vogue Knitting Mohair Contest and was one of the ten finalists! No sweater needed here, eh. I learned my shawl would be in the San Francisco runway show via email while hanging out in a room full of strangers at a lodge in Churchill, Canada. We were up at the Arctic Circle to see polar bears and Northern Lights. Picture, if you will, a crazy woman (me) jumping up in the lounge saying, “I know none of you know me and probably care nothing about knitting BUT my design was just picked to be a finalist in a design contest by Vogue Knitting. That’s Vogue people!” I promptly ran back to my room to tell my husband, who also looked at me like I was a bit nuts. The theme of the contest was based on a new book being released this week called Faerie Knitting, Tales of Love and Magic. The contest itself was sponsored by the South Africa Mohair Council and a certain percent of the design had to be knit with mohair. I hadn’t really thought about entering the contest, especially one with such a specific and unusual theme but the fates (dare I say faeries) aligned to push me to design something. In my stash, just waiting to be knit, was mohair I bought while in South Africa last year. The yarn and their story is worthy of a separate post that I’ll work on that later this week. When I think of fairies, I think Ireland. Celtic legends are full of mystical creatures. What better place to find inspiration? And so, with the yarn insisting that it be used for the contest, I packed some for our perfectly-timed trip to Dublin for my niece Caitlin’s wedding. The day before the big event, we took a day trip to Malahide Castle which has a beautiful walled garden. As we meandered the dappled pathways, it became clear there could indeed be faeries hiding in secret corners here. With a faerie garden theme settled in my mind it was time to start swatching. Showy Decrease plays a staring role in vines, cables and symmetric decreases. The design is a literal interpretation of the garden. The sides are the branches providing soft shade, the front cables the pillars entering the garden. There’s ivy winding up the back of the shawl created with the Showy Decrease. The pink bottom edge (added last) represents the blossoms scattered on the cobbled walkways. Take a look at the bind off edge in pink. A beautiful finishing touch. I’ll write up the instructions for the flowers and blog about them soon. They are knit, not crocheted. I’ll also be writing a post with the fabulous yarn maker, in there I’ll talk more about the construction and use of mohair to create a gradient effect. I probably won’t write the pattern for this version of the shawl. 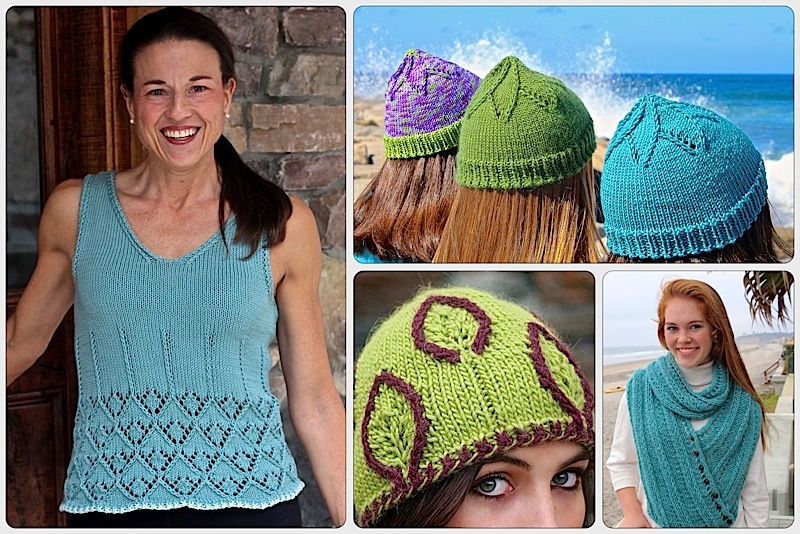 It’s pretty whimsical, but I will certainly use aspects of it to knit simplified versions. The climbing vines on the back would be perfect for a long rectangular shawl. I didn’t win the contest, but making the finals was magical (sticking with the theme here). I had fun meeting the Vogue staff, other designers and watching the shawl walk the runway. The design challenged my creativity in different ways – always a good thing. Oh, brilliant, Laura ! – and I entirely agree that the fact of making the short list is EASILY good enough ! Can’t think of another indie designer who deserves more to be rewarded. Every bit of it is Beautiful! That is gorgeous! You totally should have won but being a finalist is amazing. Omg. Congratulations 🎉🍾🎊🎈. What a beautiful shawl! Such a creative garden from your imagination. I was saddened when I read that you were not going to publish the pattern as is. Stacie – that wasn’t a definite no to the pattern. I have all the notes but the yarn is a big part of it and it’s from South Africa. Still thinking…. Congratulations! Sounds like a very exciting and validating experience for you. And would love to hear about doing such a large and complicated pattern in mohair. Was the yarn 100% mohair or a blend? Don’t worry you will hear all about the design and construction. I just want to work with the Cowgirl Blues yarn designer since it was so integral to the design. And thanks! Oh this is divine, I’m not surprised you made the finals. Congratulations! I’m not a fan of shawls but that is gorgeous. Congratulations on getting to the final. I would imagine that the competition was intense. Congratulations!! The shawl is absolutely stunning. Will you be entering more contests? You should, your designs are beautiful. Congratulations! I look forward to the pattern you release based on the shawl. Please use the same decorative bind off. Glad you were inspired to create! This entry was posted on September 24, 2018 by Laura Cunitz in General, Nuances, Showy Cable and tagged knit shawl, Mohair, Showy Decrease, Vogue Knitting, vogueknittinglive.